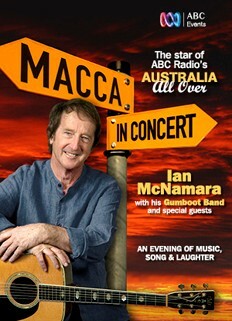 Ian McNamara hits the road with his Gumboot Band and special guests, with a concert tour to celebrate his more than 30 years of ‘Australia All Over’, the legendary ABC Sunday morning radio show that connects Aussies all over this wide brown land, and around the world. A Macca concert will showcase the songs that have touched him and his listeners, spin a yarn or two and bring to the stage his genuine love of country that makes ‘Australia All Over’ part of the Sunday morning ritual for so many people. As he travels the country Macca will also be joined by special guests, singing songs from his best selling ’Top 100’ CD and just like Sunday morning , you never know who will turn up. It’s a night of music, song and laughter. There’s a video montage of Macca’s many outside broadcasts and if you ask him nicely he might reprise his rock n’ roll days as one of Col Joye’s Joy Boys. I know he would love to see you, so… “Get on with it Macca”!